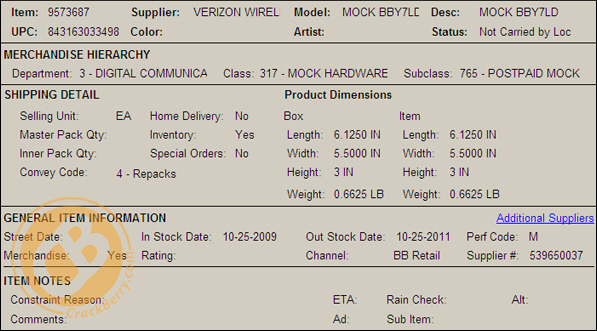 Last week BGR posted a capture showing that the SKU for the BlackBerry Storm 9550 mock-up device was already in Best Buy's inventory systems, and we followed up showing the SKU for the actual device. Both of SKUs showed at in stock date of October 25th. However, soon after those posts went live we received emails from a few more Best Buy tipsters letting us know that the Best Buy's inventory systems were no longer showing anything related to the Storm 9550 under the item numbers which were referred to in the posted images. Were the originals photoshops? Or did Best Buy just change things up after seeing them hit the web? The answer is that it was the latter, as we have new images for both the mock-up BlackBerry Storm 9550 and the actual device (class 317 and class 327) which once again show the info for the new BlackBerry Storm. 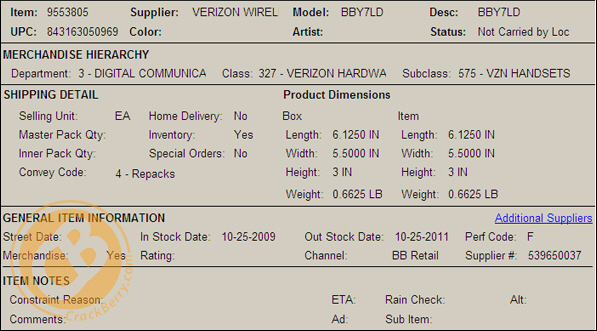 This time the device model is listed as BBY7LD, but it's definitely the new Storm and is still showing an October 25th in stock date. So for all the Storm 2 chasers out there, things are looking good - the fact they're playing hiding games with the device is a great sign!